Josie, usually the best and first at almost everything, is the last in her class to lose a tooth—and she’s determined to change that. Josie and Richard are friends with a healthy dose of competition at Blueberry Hill Elementary School. After a few unsuccessful attempts to lose a tooth just like Richard (and all her classmates), she laments, “What if she had baby teeth for the rest of her life?” Richard, the perennial friend, cheers her up with a game of shark-chases-squid tag during which Josie accidentally loses her tooth—literally. Josie worries that the Tooth Fairy won’t come through on her end of the bargain and writes her a letter of appeal. A surprising gift reveals an understanding Tooth Fairy who boosts friendship over money. Mann’s rustic pencil-and-pastel illustrations so closely resemble a child’s drawings it’s as if Josie has chronicled her own story. The inclusion of the letters to and from the Tooth Fairy may very well inspire young writers. The realistic dialogue, effective use of italics, and simple, kidlike vocabulary work well with the illustrations to create a satisfying tale on a familiar theme centered on friendship, play, and imagination. Josie has brown skin, rosy cheeks, and dark brown braids, and Richard has pale skin, freckles, and red hair. I am always interested in seeing the latest picture book release from Jennifer K. Mann. Her stories possess such respect for the inner lives of children, and she captures domestic and school-related dramas so perfectly. (Here’s my 2016 7-Imp interview with her, if her books are new to you, by chance, and you want to explore.) Her newest picture book, Josie’s Lost Tooth (Candlewick), is no exception. It will be on shelves next month. Here’s a quick peek inside. Now, let’s just admit that this whole tooth-losing part of childhood is hard. And CREEPY. (Is it just me? I always have dreams my teeth are falling out, so it may be just me.) The whole experience can be rife with drama and pain and tears — but also some thrills, on account of the tooth fairy herself. Whether or not you had a tooth fairy as a child and/or whether or not you have children now and engage in the whole tooth-fairy thing, Mann’s book resonates. This is the story of Josie, whose baby teeth stubbornly remain. She really wants to lose a tooth, and she really wants a coin from the Tooth Fairy. When it finally happens for her, as the result of a stumble on the playground at school, she is unable to locate the tooth that dislodged itself from her gum. What can she put under her pillow now? She decides to leave a note for the toothy fairy — and she gets one in return. Plus, a surprise for both herself and her friend at school. This is a story of vulnerability, friendship, mystery — and maybe a little bit of wanting to grow up. Oh, and SHARK TEETH. Bonus! Published by Boyds Mills Press, Percy, Dog of Destiny is due on bookstore shelves March 28, 2017. Sam and his stuffed bunny, Jump, "do everything together. Because they are best friends." But when Sam goes to the beach, he meets a boy named Thomas, and they have so much fun that Sam forgets all about Jump when he leaves. Luckily, Thomas doesn't. With its simple sentences (set in a typeface that has an understated poignancy), roundheaded characters, and softly colored watercolor-and-ink renderings, Mann's (I Will Never Get a Star on Mrs. Benson's Blackboard) story raises some powerful and provocative questions about loyalty, responsibility, and friendship. Was Sam being thoughtless or even disloyal when he put Jump aside to play with Thomas? On the other hand, Jump is a toy--perhaps even a "baby toy"--and Thomas is a real peer who seem like he's make a very good friend (and proves it when he rescues the forgotten Jump). Doesn't Thomas have a greater claim on Sam's attention? Mann splits the difference in the end, but both adults and kids should find this ostensibly unassuming story offers significant food for thought. When a small boy forgets his precious stuffed rabbit at the beach, he fears the worst. “Best friends” who “do everything together,” Sam, a white boy, and his stuffed rabbit, Jump, go to the beach, where they meet a black boy named Thomas. They play together all day. When he gets home, Sam realizes he’s left Jump at the beach. His mother promises they will return to the beach in the morning, but Sam can’t eat dinner or enjoy his bedtime story and spends the night imagining terrible things happening to Jump. In the morning, Sam can’t find Jump anywhere at the beach and “nothing was fun” without him. Then Thomas returns carrying the missing Jump, and all’s well. Sweet, endearingly simple illustrations created with pencil, watercolor, and “digital magic” judiciously use white space to focus attention on inseparable Sam and Jump sharing tea, soaping up in the tub, and sitting side-by-side on a tree branch and in an overstuffed chair. Following Jump’s abandonment, murky, blue-gray backgrounds emphasize Sam’s sadness, isolation, and fear, while Sam’s solitary figure on the beach echoes his loneliness and loss, reprieved later in the silent hug of his reunion with Jump. I Will Never Get a Star From Mrs. Benson's Blackboard. My newest picture book is now available wherever you buy books! It's published by Candlewick Press, and was released June 9, 2014. This book has been very dear to me in so many ways: the first project in my long journey to publishing that really felt like it might be publishable. I learned dilligence I waited a long time to see this one in print, but the wait has been totally worth it. I've gotten some lovely reviews and a couple of stars, from Publishers Weekly, and The Bulletin of the Center for Children's Books! "In a world—in this case, Mrs. Benson’s elementary school classroom—where the neatniks and rule-followers get stars by their names on the blackboard, what’s an inveterate doodler and daydreamer like Rose to do? Fortunately, Mrs. Benson isn’t as autocratic and uncompromising as she seems: she gives Rose a much-needed pass on desk inspection day (“Close call, huh, Rosey? I’ll look at yours tomorrow”), and sees star-worthy creativity in an enormous thank-you card that Rose makes for a visiting painter (“Rose, you are a true artist, just like Mr. Sullivan”). Mann, in her second book as both author and illustrator, works with assurance as she puts her jittery ink line and layered washes of color to work in the service of both emotional vulnerability and schoolroom slapstick without missing a beat. On the heels of her similarly sensitive treatment of an outsider making it work in Two Speckled Eggs, Mann is well on her way to becoming a champion portrayer of those who color outside the lines or march to a different drum. Ages 5–8. Agent: Holly McGhee, Pippin Properties. (June)"
School Library Journal called my illustrations "effervescent"! More adept at doodling and daydreaming than correctly completing math problems on the board, reading aloud clearly, or maintaining a “spick-and-span” desk—all achievements that are lauded in her classroom—Rose has begun to tell herself, I Will Never Get a Star on Mrs. Benson’s Blackboard (Candlewick, 2015; K-Gr 2). And indeed, the teacher does maintain high expectations for her students, though she kindly redirects the young narrator and even cuts her some slack (as in a much-needed desk-inspection reprieve). When the class is instructed to craft thank-you cards for the painter who visited the day prior, Rose pulls out her art supplies and manages to once again make a mess of her desk (and herself), but also creates a “super-gigantic” masterpiece that catches Mrs. Benson’s eye (“Rose! You are a true artist, just like Mr. Sullivan”). After a bit of clean up, the proud teacher allows Rose to draw her very own star on the board. Jennifer K. Mann’s simple text and effervescent mixed-media illustrations sparkle with keen understanding of a child’s perceptions, tender humor, and an empowering message about individuality. Rose’s teacher, Mrs. Benson, gives stars for neatness and spelling, but Rose is a daydreamer and a doodler, so she’s certain that she will never get a star on the blackboard. It’s not for lack of trying, but when she raises her hand to participate she loses track of the question, and when she offers to pass out the snack she ends up tripping and dumping it on the teacher. When it’s time for students to make thank-you notes for a visitor, Rose dives headfirst into the task with her usual chaos, only to find herself facing a neatness check. Much to Rose’s surprise, however, when Mrs. Benson spots Rose’s magnificent painting amidst the paints, pencils, and spills, she not only doesn’t get angry but notes that Rose is a “true artist,” gives her time later in the day to clean up, and awards her a star. This charming story is both affirmative and celebratory of the different skill sets children possess; Rose may not fit into the typical star-on-the-blackboard mold, but she is fortunate to have a teacher who appreciates her passion and artistry. Rose’s narration is authentic, equal parts longing and fatalistic as she tries to fit in. Her chaotic tendencies are on fine show in the ink, gouache, and digital collage illustrations, which slightly resemble Lauren Child’s in their childlike linework and streamlined visuals. Rose herself is a bit haphazard, with red braids flying and shoes untied; hard at work on her painting during desk check time, she’s particularly hilarious, a smudge-faced, big-eyed dreamer looking up petrified from a chaotic scene of spilled paint and crumpled paper. There’s considerable potential for classroom conversations here, particularly as students gather to talk about different strengths, and Rose’s story will resonate with many an earnest artist trying to find his or her way onto the board. "The tyranny of childhood takes many forms: penmanship counts, as does neatness. Both daydreaming and doodling are discouraged. Poor Rose — the scattered, imaginative protagonist of “I Will Never Get a Star on Mrs. Benson’s Blackboard” — is suffering from these common varieties of childhood blues, out of synch with her teacher, Mrs. Benson, and her classmates. Rose stares dreamily into space while children around her eagerly raise their hands. She sketches a charming row of vehicles and animals on the chalkboard instead of listening to Mrs. Benson dictate a math problem. It takes a visit from a painter with a Miro-like style to set Rose on the road to discovering her gifts and earning her star. But you don’t have to be a visual artist to identify with Rose — shoelaces untied, braids askew, face adorably smudged. Being misunderstood and feeling out of step with your teacher and classmates is a feeling all children can keenly relate to. Many days even the kindest teachers can seem full of reproach. Remember the James Marshall classic, “Miss Nelson Is Missing,” the book about the docile teacher bullied by her students? The recalcitrant kids get their comeuppance when the severe “substitute,” Miss Viola Swamp (spoiler: she’s really Miss Nelson in a clever disguise), is dispatched to school them in manners. On the cover of Mann’s book Mrs. Benson has a distinct, Miss Nelson vibe, post witchy makeover. The sketchy pen line and wash of watercolors are delightfully Marshall-esque. But Mrs. Benson isn’t as harsh as Viola Swamp. She laughs with her head thrown back and she knows a true artist when she sees one. In fact, by the end, Mrs. Benson even gets a star of her own. Nicole Lamy can be reached at nicole.lamy@globe.com." A successful first day of school does not, of course, mean that a child’s apprehensions will disappear. There are plenty of other things to worry about, such as gaining the approval of a neatnik teacher when you yourself are rather messy. That is the anxiety that torments young Rose in Jennifer K. Mann’s “I Will Never Get a Star on Mrs. Benson’s Blackboard” (Candlewick, 40 pages, $16.99). Here the poor heroine tries repeatedly to earn a star—volunteering to solve a math problem, offering to read aloud—and feels wretched that instead, each time, her teacher mildly corrects her. And when Rose learns that Mrs. Benson will check the children’s desks for neatness at the end of the day, she begins to feel sick: “I wondered if Mrs. Benson was the kind of teacher who dumps messy desks on the floor.” In ink, gouache and digital collage illustrations we see this terrible scene as Rose imagines it, with a vengeful teacher, jeering pupils and her own humiliation. As the reader will have already realized, Mrs. Benson is not nearly as ferocious as Rose thinks and, indeed, in her classroom it turns out that a degree of artful messiness has its place. I hope you will like it as well. Let me know what you think! Two Speckled Eggs is my first picture book as author and illustrator, and it was published by Candlewick Press in April, 2014. Since then, it received the 2015 Washington State Book Award/Scandiuzzi Children's Book Award. it was selected for the Spring 2014 Kids' Indie Next List--"Inspired Recommendations for Kids from Indie Booksellers!" It was also awarded a Parents' Choice Gold Award. Anyone who thinks children’s birthday parties are easy has never had one, thrown one, or attended one. In “Two Speckled Eggs’’ Ginger’s mother rightly decrees that either all the girls in Ginger’s class must be invited to hers or none. Needless to say, Lyla is the first guest to arrive. Ginger isn’t exactly thrilled to see her new guest at first. Slowly but surely the “nice” girls begin acting not so nice. They cheat at party games, make fussy demands, refuse to eat the special birthday cake that Ginger and her mom have so carefully prepared. Lyla stays off in a corner studying something through a magnifiying glass. Her steadfast calm, good humor, and her gift of “two speckled eggs” proves she has the makings of a truly great friend. “Two Speckled Eggs’’ gives us the flavor of childhood as we actually live it — that high-tension mix of sweet and the sour, terrific and the terrible. Author-illustrator Jennifer K. Mann conveys all this almost telegraphically in the sparest language, the most off-hand images. No picture book pyrotechnics here, but plenty of soul. “Two Speckled Eggs’’ is not so much old-fashioned as it is ageless and timeless. Mann’s soft color illustrations bring the birthday party alive with gentle humor and self-deprecation. More than a birthday book, “Two Speckled Eggs’’ is about the gift of friendship. Without fanfare or fantasy, Mann has made her debut as writer-and-artist with a genuine picture book classic. Two opposites may not be as opposite as they imagined in Mann’s look at grade school cliques and oddballs. Ginger wants to invite all the girls in her class but Lyla Browning to her birthday party. Lyla wears drab clothes and glasses, and her affection for insects (not to mention pet tarantula) is certainly unpopular among Ginger’s crowd of friends. But Ginger’s mom says it’s all or none, so Lyla’s invited too. But Ginger’s friends turn out not to be the best party guests, doing whatever they want and ruining the games. At this point, Lyla is just part of the background with her ever-present magnifying glass. But that changes when she is the only one to appreciate the much-anticipated “silver-and-gold cake.” And Lyla’s present turns out to be the most thoughtful of all—a handmade bird’s nest with two speckled malted-milk eggs in the center (two peas in a pod, anyone? )—and the start of a lasting friendship. Mann’s pencil, gouache and digital collage illustrations keep the focus on the girls, their bright clothes and accessories standing out against the white background. The placement of characters in page composition plays a large part in getting Mann’s message across, girls either center stage or relegated to the background (if they’re even on the page at all!). Click on the book's image above to order Two Speckled Eggs! 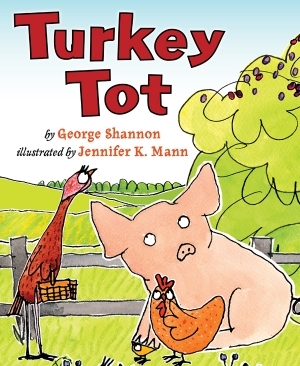 Turkey Tot, by George Shannon, is my debut book as an illustrator. It was published by Holiday House, October, 2013. Available here, or through your favorite independent bookseller!